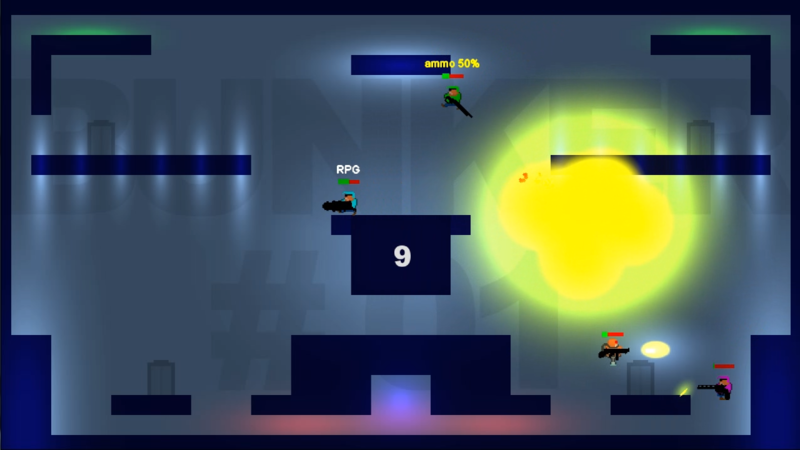 Kill2Kill is an upcoming platform shooter. Players go down in battle bunkers deep underground to kill to kill. Every man for himself or a team of killers versus a horde of mutants. Local multiplay, singleplay, online highscores and lots of unnecessary violence. What makes Kill2Kill unique is the 45 degrees auto-aim mechanic. Characters aim at their closest enemy automatically, but only as far as the best of 8 directions. This way players can fully focus on their movement and further develop tactics. It’s great to still receive comments so many years after I made that game. I’d never imagined that. You should definitely get into game development! There’s so many ways to learn how and make games and the feeling of finishing a game and see people play it is downright awesome. Thanks for the offer, I would have seriously considered it if it wasn’t for the game I’m working on now. Its a text adventure/rpg game in fact. Will post something about it soon.